Win-Win: It doesn’t mean you win and I win. It means I win twice. Lately, I’ve been reading a lot about building an effective blog – and I’ve been realizing how right all that I’ve been reading is. It’s mostly stuff that I’ve mentioned before, things that help draw people to your blog. And really, the key is specialization. In the blogosphere, there are multiple types of blogs. The first, and most common type, are simple personal blogs. These are, as the title suggests, personal in nature, run by a person or family to serve as an informative portal to those who have a personal interest in the individual or family running the blog. For example, if my mother ran a blog, I may be interested in reading what she had to say, for the simple fact that she was my mother. However, a personal blog run by a person I’ve never met, have no close connection to, who lives in the outskirts of Toronto, probably holds no interest to me. 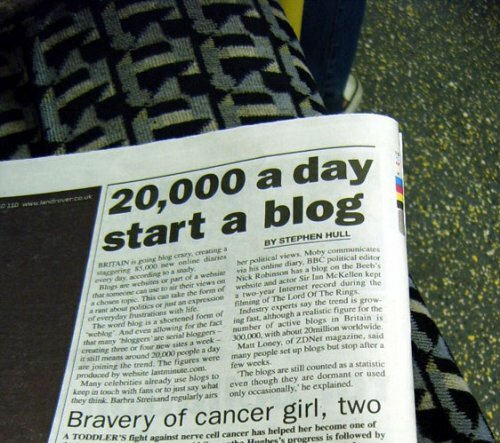 There are also special-interest blogs. These specialize in informing members of a specific community of advances in that community, and therefore providing info that is valuable to those members of the community. These serve a role very similar to that of special interest magazines, though they do have some important advantages – as they’re normally free. But the fun doesn’t stop there. There are also corporate blogs and news blogs. As you might imagine, corporate blogs apply mainly to shareholders and others who hold a vested interest in specific corporations or companies. News blogs apply to any person who has an interest in the type of news provided, though they are almost always run by large news corporations. Before building a site, it’s important to consider what type of blog you want it to be. Personal blogs are easy to build and maintain, because they rely on little more than some relatively interesting personal stories. Since I know nothing of either news blogs or corporate blogs, I’ll instead focus on special-interest blogs. These, in particular, require frequent posts, in-depth study, and high-quality content. But, of course, these blogs also provide valuable business opportunities. It’s for that reason that I’ve decided to focus more on building a special-interest blog. I’ve decided that building a special-interest blog could help me in many ways to be able to improve myself. Up to this point, my site has been somewhere in-between. I’ll still maintain a personal blog, for those of you who enjoy reading about my life. But, in the meantime, while I’m building new layouts for both blogs and figuring out exactly how I’m going to arrange it, I doubt that I will be posting much. And, hopefully, when I’ve got it all organized, some of you will find the information on my other blog to be interesting. Oh, and by the way, this post was meant to be a sort of test to see how I could do in formatting a more detailed, interest-based post. How do you think I did? Let me know in the comments, if you would be so kind. Wussell!! Please continue with your personal blog! I will, of course, read your special-interest blog, but I want to know what’s happening with you! How was your trip?